These purses are made from vegetable tanned goat skins that have been dyed using period dyes. They are lined with chamois and are made entirely by hand. 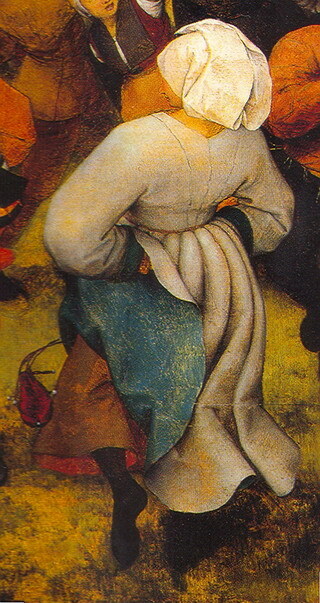 The design is based on a figure in 'The Wedding Dance In The Open Air' by Pieter Bruegel painted in 1556. 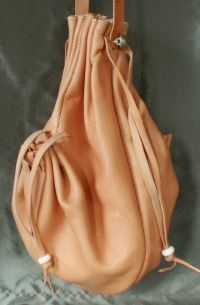 They hang from a leather cord and the top is held closed by two leather draw strings. The more elaborate version has decorative piped seams. This style is also available with a side gusset which makes the main bag much bigger. They measure 6 inches wide and 8 inches long (15 x 20 cm) when open.